MANILA, Philippines - The official results, list of passers, top examinees and other important announcements for August 2017 Civil Service Exam - Pen and Paper Test (CSE-PPT) both for professional and subprofessional levels are released by the Civil Service Commission (CSC) within forty one (41) days after the eligibility examinations. Below is the complete list of passers for August 2017 CSE-PPT SubProfessional Level in Region 13 (National Capital Region - NCR). ZARA, WILHELMINA S CSE-PPT (Professional and SubProfessional) are eligibility exams conducted by CSC twice a year to cater the growing number of individuals who wish to serve in Philippine government. Paano po ba malalaman yung review of exam result kahit walang examinee number? Nakalimutan ko po kasi eh. Thank you! final na po ba ito? paano po mlalaman ung rating ko? kahit nakadetalye na po may examinee no. na ayw paren? 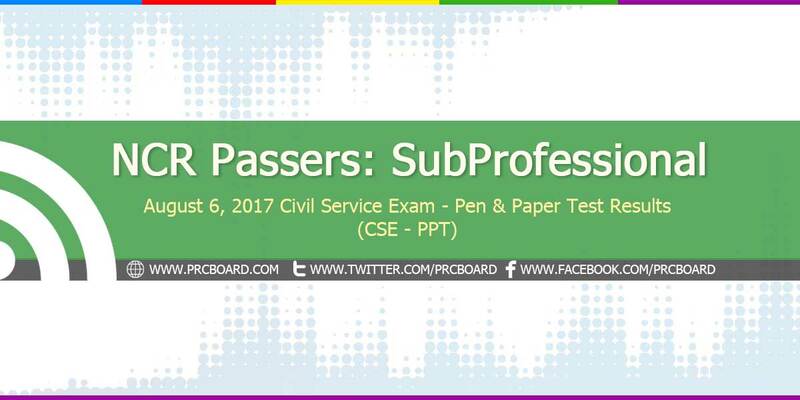 Good day!Ito na po ba talaga ang official and complete list of SubPro passers for NCR? Congratulations to all passers! Thank you!